The oil is a colorless to pale yellow liquid with a sweet, floral-herbaceous scent and balsamic-woody undertone; it has a more fragrannt floral scent than spike lavender. It blends well with most oils, especially citrus and florals; also cedarwood, clove, clary sage, pine, geranium, labdannum, oakmoss, vetiver, patchouli (our Everlasting oil), etc. An evergreen woody shrub, up to 1m(3 ft) tall, with pale green, narrow, linear leaves and flowers on blunt spikes of a beautiful violet-blue color. The whole plant is highly aromatic. 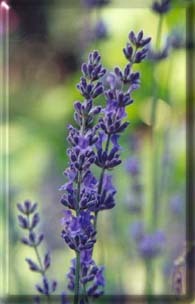 Lavendar has long been used in love spells and sachets. Clothing rubbed with the fragrant flowers (or placed in a drawer with clothes) attracts love. These flowers are also burned or smouldered to induce sleep and rest, and are scattered about the home to maintain its peacefulness. The plant is so powerful that, if when depressed, one gazes upon the plant all sorrow will depart and a joyous feeling will settle upon the observer. Lavendar is also used in healing mixtures, carried to see ghosts, and worn to protect against the evil eye. It is added to purification baths. Our lavender is 40/42. Lavender is well-established and familiar to almost everyone. Used as a cosmetic water, an insect repellent, stops itching from insect bites and bee stings, to scent linens, use it in a hot foot bath to reduce fatigue. It relieves toothache, neuralgia, sprains and rheumatism and to relieve headaches. Lavender is one of the best and most popular relaxing oils. Put a few drops on a cloth and lay beside your pillow to aid sleeping. Its uses are unending.